The more I think about the waste that we produce through our culture of (excess) consumption, the more I realise how much of a lack of education we have about the best ways to dispose of things in the most environmentally friendly way. We all know that reduction in consumption is the first step but what happens to the things that we continue to consume on a regular basis? I thought it would be helpful to share some of the research that I have done around this kind of thing, and starting at the beginning with something that so many people begin their day with… coffee! I’ve read that we send 500,000 tonnes of coffee to landfill each year in the UK alone – crazy right? Although unsurprising with the coffee drinking culture that we have created. At home, I make my coffee in a cafetiere. I love the ritual of it but I spent a long time unsure of what to do with the grounds that remain. Do they go down the sink? In the food waste or compost bin? Should they be saved and repurposed? I like to make scrubs from time to time but the truth is I drink more coffee than I can scrub my skin with! In researching what to do at home I came across many different recommendations for how to use up the wasted grounds yourself, as well as some exciting businesses that are taking things one step further and doing some REALLY cool things with coffee! So check those out first, and then if you gotta throw it away, then make sure you read below to be in the know about how to do it right. Disclaimer: I am very much exploring how to do all of this myself as I dive into my #notimetowaste movement. If anything here is incorrect, please let me know as I want to LEARN and share helpful knowledge so that we can make positive change together! Do NOT pour coffee grounds down the sink. Sorry to be the barer of bad news but the easy option is not going to cut it. Pouring the grounds down the sink not only risks blocking your pipes over time, but they also still have a lot to give beyond that first brew! Drain out the water, then place your grounds in the compost. Although coffee is considered acidic, I have read that the brewing process removes most acidity as it is water soluble, leaving a fairly neutral residue of compostable grounds full of minerals and very attractive to worms! 1) Make a scrub - check out this 'recipe' or follow the video below (not just for Christmas!). Yep – deodorize your fridge with coffee grounds. Place a small bowl in the back of the fridge and let the coffee work its magic. Same as above – but this time for your hands. Get rid of smells like garlic after cooking by scrubbing your hands with coffee grounds! This will remove the dead skin from your hands, which is apparently where most of the smell sticks! I am really good at killing plants. I read that coffee grounds are great for keeping pests away from garden plants, and that some plants love coffee due to the acidity* but now I’ve discovered that it works for helping house plants to thrive too! This is because of the nutrient density of the coffee grounds and if this is the secret to happy house plans I’m going to be a happy bunny! * I am not a gardener, in fact I am pretty good at killing plants but there is some discrepency between this point and the one above suggesting that brewing coffee removes the acidity. If anyone KNOWS the answer, do let me know. I will leave it to the green fingered, or science, experts to clarify on this one! Now this is pretty cool! This company are using the premise that there is no such thing as waste to recycle coffee grounds into advanced biofuels and biochemical. WOAH. So not only does coffee fuel your day but it can also fuel our homes too? Yep. So take the ‘waste’ coffee grounds and repurpose them and they are no longer waste. “The UK produces 500,000 tonnes of waste coffee grounds every year, most of which is disposed of via landfill where it emits methane, a greenhouse gas that is 28 times more potent than carbon dioxide. As well as damaging the environment, landfill is a costly method of waste disposal for businesses because of the UK government’s landfill tax. You guys have heard me shout about these guys before, but it is definitely worth sharing them again. Optiat is founded by sibling pair William and Anna Brightman. For Christmas 2015 William was given a cafetiere. Brewing his morning coffee, he was left with the residual coffee grounds. He had no garden to dispose of the grounds, so was forced to simply throw them away. He realised that if he alone was throwing away this large an amount of coffee each morning, then given the size of the coffee industry, on a wider scale there must be an awful lot of waste – and he was right! 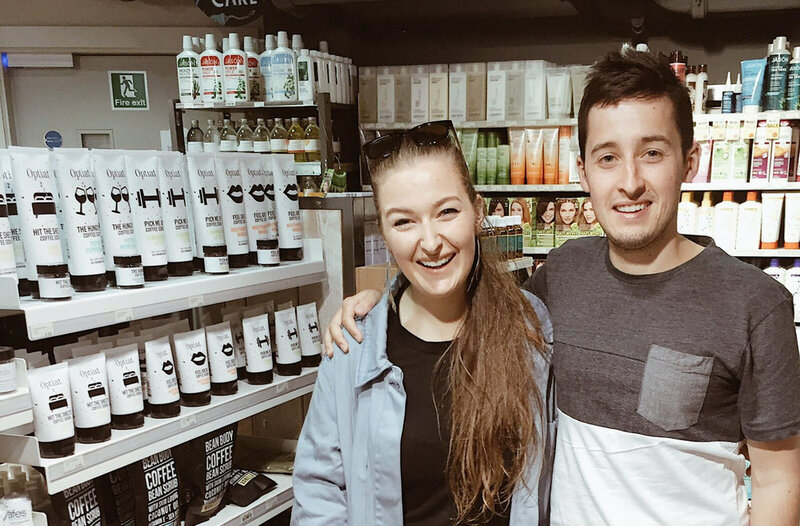 I met Anna and William a few years ago and have been excited to see their brand grow. I take their scrub with me when I go somewhere sunny and swear by it for keeping my skin smooth and blemish free in the sun!